and his buddy Bill Sherwood were the top Northern California Corvette drivers in 1961. He and Sherwood had many fine battles with each other and with their Southern California rivals, Dave MacDonald and Bob Bondurant. Reinhart (#6) and Sherwood neck-and- neck at Cotati on November 11-12, 1961. Reinhart won this race. 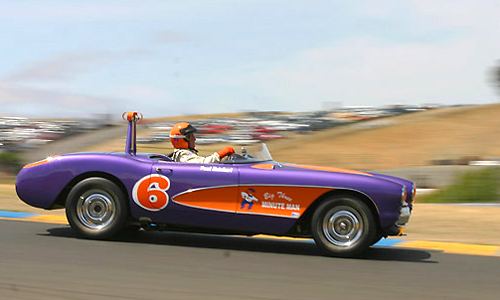 For 1962 Reinhart painted his Corvette in purple and orange Union Oil colors. Reinhart leads Sherwood and Don Wester in his Porsche Carrera at Vacaville on August 19-20, 1961. Video! See Reinhart in action at Santa Barbara on May 26-27, 1962. Reinhart resurrected his Corvette in its 1962 paint job for the 2002 season and raced it until 2010, when he was into his 80s. Reinhart moved to this Corvette Stingray for the 1963 season. Here's Reinhart in the same car at Sears Point in the 1980's. He vintage raced the same car until the year 2000. Tom Armstrong now owns and races this historic Stingray. In the mid and late 1960s Reinhart campaigned a Genie-Chevy in USRRC and other pro events. New! (2-28-13) Paul Reinhart (2) -- Peter Darnall's photos!